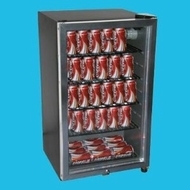 This spacious beverage center from Haier holds up to 125 cans of soda or beer for all your stockpiling needs. It's perfect for the dorm room, den or garage. Just stockpile the sleek black cabinet with your favorite thirst-quenchers, and grab a can whenever you please. The glass door lets you check the contents at a glance, and an automatic interior light illuminates when you open the door. It even accommodates tall bottles with a handy flip-shelf.